Since 1758, the Hôtel de Crillon has lit up Paris with its grandeur and magic. The hotel currently closed for total renovation that will take 2 year. It will open its doors again in 2015. 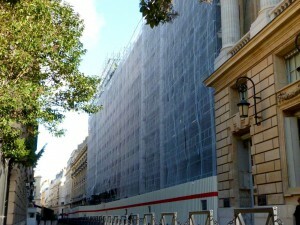 This masterpiece of 18th century architecture is undergoing major work to meet its guest highest expectations. The renovation will enhance the nobility and elegance of the site whilst retaining the spirit of this prestigious building. The Aulnay branch is installing scaffolding required for the redevelopment work, amounting to 6500 m2 scaffolding to the façades and courtyards, and a temporary 2900 m2 cover. The site is scheduled to last for 11 months.